Atlanta Real Estate Forum congratulates Brock Built for winning a Gold OBIE in the Best Social Media Application – Builder/Developer category. Presented by the Atlanta Sales and Marketing Council, the OBIE Awards are the premier awards given in the Atlanta new home construction industry. 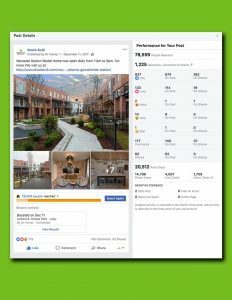 On December 1, 2017, when Brock Built debuted its new decorated model home at Westside Station, it posted on Facebook to let its followers and target demographic know. Located in the sought-after West Midtown area of Atlanta, this community of single-family homes and townhomes offers a variety of floor plans and home designs. Styles range from contemporary to urban olde mill and popular farmhouse. This Facebook post was to bring awareness that the model home is open and it was successful as it increased the web traffic by 35%! For more information, visit www.BrockBuilt.com or call 470-899-9430.